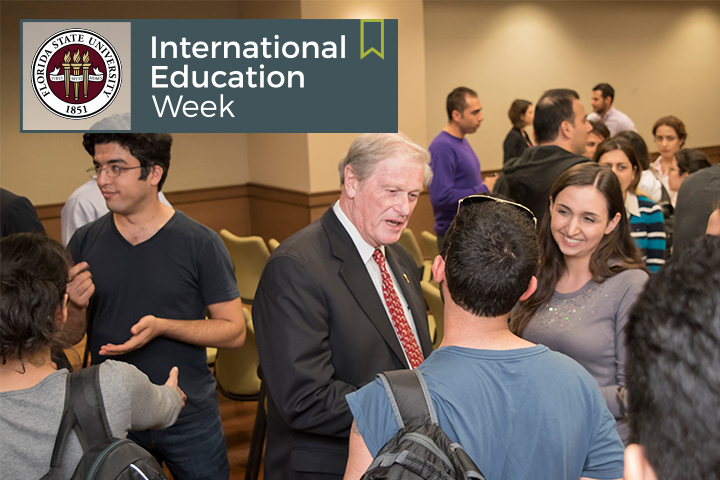 Florida State University will celebrate International Education Week along with the rest of the nation Nov. 13-17. International Education Week provides an opportunity to highlight the benefits of international education and acknowledge the importance of having international students and scholars on campus. This year, Florida State is one of four institutions to receive the 2017 Senator Paul Simon Award for Internationalization, awarded by the Association of International Educators (NAFSA). The award recognizes FSU’s comprehensive efforts to internationalize campus. Thrasher will travel to Washington D.C., during International Education Week to accept the award and participate in NAFSA’s annual presidential panel for Paul Simon Award winners on Tuesday, Nov. 14. He will discuss FSU’s accomplishments leading up to this award and its ongoing commitment to internationalization. Watch the webcast at www.nafsa.org. In honor of International Education Week, the FSU Center for Global Engagement has a weeklong schedule of enriching events to celebrate and explore other cultures and global issues. Going Global: A showcase of FSU students’ experiences abroad and a dessert reception will be held from 3:30 to 5 p.m. in the Globe Auditorium. Middle East Film Festival Closing Reception: The festival will conclude with a screening of the movie “The Idol” at 6 p.m. in the Askew Student Life Cinema. CANCELED – Lecture: “Europe: Between a Russian Rock and an American Hard Place”: Peter Ford, a global affairs correspondent for the Christian Science Monitor will discuss the challenges and opportunities that Russia’s activism and U.S. disengagement present to Europe. The event takes place from 5 to 7 p.m. in the Globe Auditorium. Japanese Tea Ceremony: Experience Chanoyu, the ancient Japanese ceremonial tradition of preparing and presenting matcha tea, from 6 to 8 p.m. in the Globe Auditorium. FAMU-FSU College of Engineering International Education Week Reception & Student Organization Fair: Students, faculty, staff and alumni are invited to this first-time event to celebrate the many cultures represented at the College of Engineering. The event takes place from 3 to 5 p.m. at the College of Engineering, 2525 Pottsdamer St. Registration is required. InternatioNole Trivia Night: Test your international knowledge from 7 to 9 p.m. in the Globe Dining Room. International Coffee Hour: Enjoy a special edition of International Coffee Hour featuring FSU’s French Department and French culture from 5 to 6:30 p.m. in the Globe Dining Room. For a full schedule of events or more information, visit cge.fsu.edu.